WACO, Texas—A traditional, Texas-style Thanksgiving dinner for 10 will cost $48.08 this year, up a little more than 4 percent from last year, according to the special Texas Farm Bureau (TFB) 2013 Thanksgiving Meal Report. 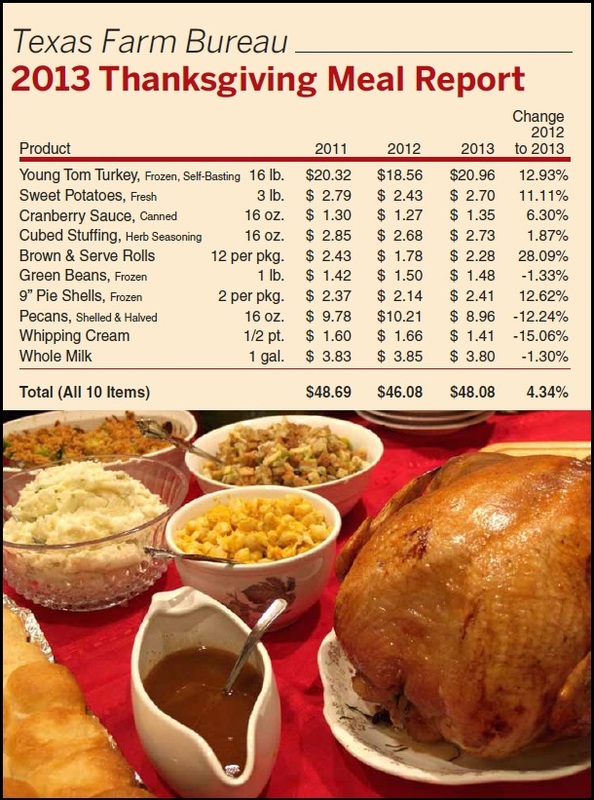 The 2013 report shows an increase of $2, or 4.34 percent, from the 2012 TFB Thanksgiving Meal Report. The survey records the cost of 10 holiday staples—including turkey, stuffing, sweet potatoes, cranberry sauce and pecan pie—to feed a family of 10 people. “The price of a traditional Thanksgiving meal has increased a bit, but it’s still possible to feed a well-balanced meal to a family of 10 for less than $5 per person,” said TFB President Kenneth Dierschke. Much of the increase was driven by turkey prices that registered 12.93 percent higher than last year. With Thanksgiving coming later this year, many of the Grocery Price Watch shoppers missed featured pricing on turkey when the survey was taken. Texans will pay more for six of the Thanksgiving staples this year: young tom turkey, frozen (up 12.93 percent); sweet potatoes, fresh (up 11.11 percent); cranberry sauce, canned (up 6.30 percent); cubed stuffing (up 1.87 percent); rolls (up 28.09 percent); and 9-inch pie shells, frozen (up 12.62 percent). For the first time in three years, pecan prices have decreased, as shelled and halved nuts were down 12.24 percent, or $1.25, from 2012 to 2013. In addition to pecans, three other survey items decreased in price: green beans, frozen (down 1.33 percent); whipping cream (down 15.06 percent); and whole milk (down 1.30 percent). TFB’s fourth quarter Grocery Price Watch survey, taken in conjunction with the 2013 Thanksgiving Meal Report, indicated a decrease of 23 cents, or .5 percent, in grocery prices for household staples from the third quarter. Results from the quarterly survey of 16 common food products decreased from $46.08 to $45.85 in the fourth quarter of this year. TFB’s Thanksgiving Meal Report and Grocery Price Watch prices were reported by 41 volunteer shoppers at grocery stores statewide from Oct. 31-Nov. 6. TFB has released its Grocery Price Watch survey quarterly since March 2009.